Wash the kale and remove the tough center ribs. In a pot of boiling water, blanch for 30 seconds and then transfer to an ice water bath to stop the cooking. Drain and pat dry. In a medium-sized pot, melt 1 Tablespoon butter, then sweat the onion until translucent. Add the sprig of thyme and roux, stirring until the roux is evenly dispersed. Pour in the uncooked rice and stir, so the grains of rice are evenly coated with butter/roux. Pour in the port and cook on medium heat, stirring regularly, until it is fully absorbed by the rice. Add stock by 1/2 cup increments, waiting until absorbed to add more each time. Remove from heat and immediately stir in remaining 1 Tablespoon butter and Parmesan. Remove the thyme and discard. Cut pork belly into 1 1/2-inch thick cubes. Sear in a lightly greased pan, starting skin side down to render out some of the fat and crisp the skin, then flipping to the sides. Smash lightly after searing. Cut each fig in half. In a pan, melt butter, then add figs and toss. Let cook on low/medium heat for 15-30 seconds, then add honey. Remove from heat. Place a mound of risotto on a plate. Scatter pieces of kale around risotto. 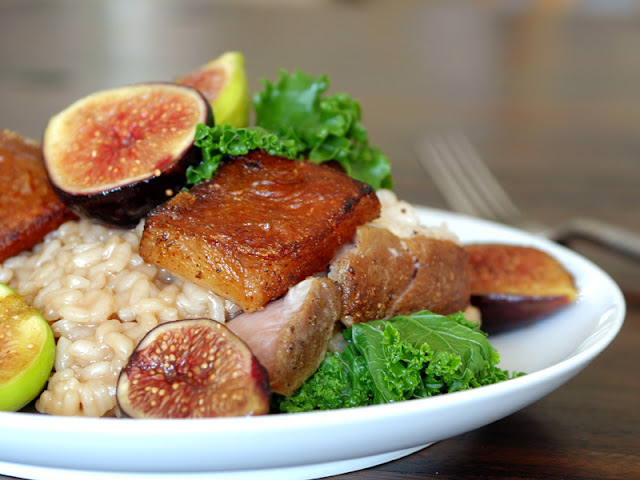 Add pork belly and figs. Serve immediately.